Baby bathtime. It can be fun and relaxing. But, trying to keep a wriggly one occupied and safe can cause havoc on your knees and arms. Fear not, we’re here to help. We’ve picked out some of our fave useful and stylish bath kit, that’s great for them, you and your home decor. Bathtime bliss has never been so simple! The Puj Arm Rest sits on the rim of the bathtub and is double padded. It means you can rest your arms in comfort while you support babe. The Herringbone design looks great, while the easy hang loop can be used to store and dry it after use. Practical and stylish, we 💓. Fill your bathroom with bath toys that look great and educate kids too with this A Little Lovely Company Raindrop Bath Toy. In a stylish, simple raindrop design, it’s ready to be filled with water and then lifted up for a rain effect. It’s great for teaching kids about the weather while getting in sneaky hair wash too. Baby baths aren’t often described as ‘cool’, but we’re going there and saying that the Skip Hop 3 Stage Moby Baby Bath really is. Shaped like a whale, it features an adjustable insert that takes it from a newborn bath to toddler safe without needing any additional bits. The sling locks into place for tiny babies, then adjusts to a simple seat-back for growing tots. When they’re too big for bathtimes, it makes a great water play or storage device. The Puj Kneeler saves your knees and style. Double padded, just place it on the floor and kneel. It’s that simple. In a cool herringbone design, it’ll fit any decor, then use the handy loop to hang it away when bathtime’s over. Yass! Hair washing and kids. They’re hardly a match made in heaven… we know, we’ve been there. That’s where the Moby Bath Rinser swims in to save the day, letting you rinse rinse bubbles from kids’ hair without getting any water in their eyes. The soft mouth of the whale directs water away from their face, while the easy grip handle lets you hold the rinser in one hand and your kid in the other. To dry, simply hang it using the handle. The A Little Lovely Company Umbrella Bath Toy is another awesome bath toy that mixes style and fun. Shaped like an umbrella and with smiling face detailing, it can be submerged in water and then held up so it 'rains'. It's great for teaching toddlers all about cause and effect. Take cover parents! 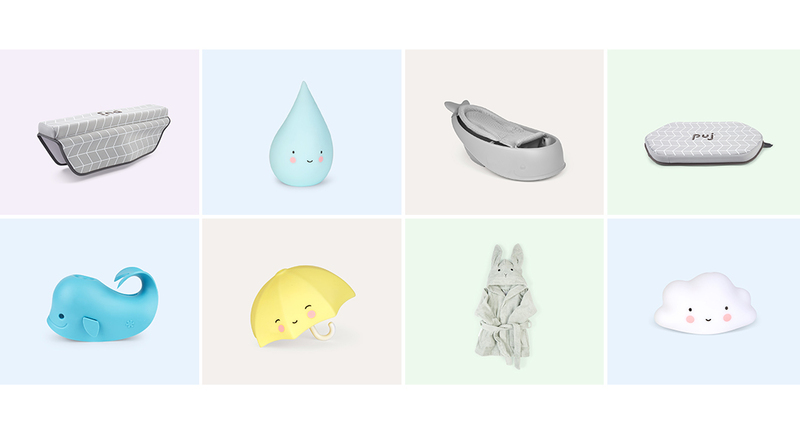 This A Little Lovely Company Cloud Bath Toy floats into our picks, because, well, it looks so darn cool. Submerge it, then lift it up for rainy, splashing fun. Shower caps at the ready grown-ups! And there it is...8 stylish and cool products to make bathtime run smoothly and comfortably. Want more? We’ve got it covered, just check out our full bath range. Splash to it!